1. Open the Physician Portal module. 2. Select the studies you would like to record to a CD/DVD or a USB flash drive, and click Pack. 3. Select ISO to burn a CD/DVD or ZIP to copy the study to a USB flash drive. 4. 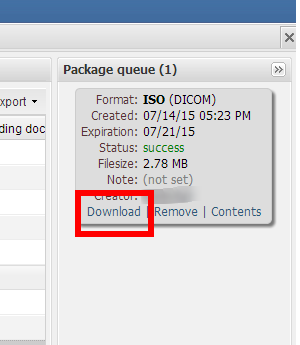 Select Store original dicom images (DCM) to save original DICOM files. You can also select Store preview for DICOM images (JPEG/AVI/TXT) to save image previews. Then click OK.
To burn the ISO file to a disk, you may need to use CD/DVD burning software. In Windows 7 and Windows 10 you only need to double-click the file as these operating systems have built-in disk burning software. If you have selected the ZIP format and wish to copy the DICOM images onto a USB flash drive, please extract the images from the archive and copy them to the drive. Alternatively, you can find the required studies in the PACS STORAGE module, if you have access to it. The Pack button in the PACS STORAGE module works the same way.